qualitatively significant political and military issue. In addition, the diversity of international views on matters related to missiles poses a particular challenge for efforts to address the issue in multilateral fora. Currently, there is no legally binding multilateral instrument dealing with the issue of missiles. Pursuant to General Assembly resolutions, three Panels of Government Experts devoted to the issue of missiles have been established within the United Nations. The first Panel was established from July 2001 to July 2002, the second Panel in 2004 and the third Panel completed its work in June 2008, agreeing on its report by consensus. Presently, several other multilateral regimes exist which seek to prevent the proliferation of missiles and related technology. These include, notably, the Hague Code of Conduct (HCOC) and the Missile Technology Control Regime (MTCR). This report was prepared by the Panel of Governmental Experts, established pursuant to General Assembly resolution 59/67 of 3 December 2004, to address the issue of missiles in all its aspects, including identifying areas where consensus can be reached. The report discusses the background and present situation with regard to missiles, and identifies a number of key issues which should be taken into account in order to address, in a comprehensive manner, the issue of missiles in all its aspects. These issues include, inter alia, the global and regional security backdrop which provides the motivation (or lack thereof) for missile development, testing, production, acquisition, transfer, possession, deployment and use; the circumstances of transfer to and use of certain types of missiles and missile technology by State or non-State actors; the issue of disarmament, arms control and non-proliferation; the interrelation between doctrines, strategies and missile-related behavior; the relative salience of ballistic and cruise missiles as well as missiles as delivery vehicles for weapons of mass destruction or conventional arms; missile defence; and the increased contribution of space-based capabilities to a wide range of human endeavours. The Panel concluded, among other things, that it was important to have continued international efforts to deal with the increasingly complex issue of missiles in the interest of international peace and security, and to further deliberate on the issue, specifically focusing attention on existing and emerging areas of consensus. The Panel also emphasized the important role of the United Nations in providing a more structured and effective mechanism to build such a consensus. The General Assembly requested the Secretary-General in its resolution 58/37, with the assistance of a panel of governmental experts to be established in 2004, to explore further the issue of missiles in all its aspects and to submit a report for consideration by the General Assembly at its fifty-ninth session. The panel held three sessions at the United Nations Headquarters during 2004, the first from 23 to 27 February, the second from 17 to 21 May and the third from 19 to 23 July. “However, given the complexity of the issue at hand, no consensus was reached on the preparation of a final report”. General Assembly resolution A/59/67 requested the Secretary-General to prepare a report, with the support of qualified consultants and the United Nations Institute for Disarmament Research, as appropriate, taking into account the views expressed by Member States, to contribute to the United Nations endeavor to address the issue of missiles in all its aspects, by identifying areas where consensus can be reached, and to submit it to the General Assembly at its sixty-first session. It also requests the Secretary-General, with the assistance of a Panel of Governmental Experts, to be established in 2007 on the basis of equitable geographical distribution, to explore further ways and means to address within the United Nations the issue of missiles in all its aspects, including identifying areas where consensus can be reached, and to submit a report for consideration by the General Assembly at its sixty-third session. The report above was prepared by the Panel of Governmental Experts, established pursuant to General Assembly resolution 55/33 A, of 20 November 2000, to address the issue of missiles in all its aspects. The report provides an overview giving the background and current situation in the field of missiles. It also describes a number of areas of concern. These concerns are related to, inter alia, the increasing number, range, technological sophistication and geographic spread of missiles and their capability of delivering weapons of mass destruction, in particular nuclear weapons, as well as conventional weapons, missile defences and their strategic consequences, the potential use of space-launch vehicle technology for the development of missiles, the role of missiles in military doctrines as well as the role and scope of confidence-building measures. The Panel concluded, among other things, that these and other issues are regarded as serious concerns for international peace and security. It noted that there are multiple approaches currently undertaken to deal with the issue of missiles, both within and outside the United Nations. The Panel also stated that it is essential to continue efforts in this regard and noted the role of the United Nations in this context. Finally, it concluded that all approaches undertaken at the national, bilateral, regional, plurilateral and multilateral levels, including the initiatives described in the report, need to be further explored. 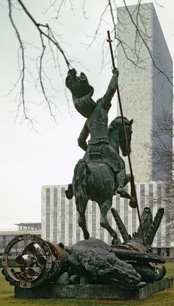 "Good Defeats Evil", a statue of St. George fighting the dragon of Nuclear War. It was sculpted using sections of decommissioned Soviet SS-20 and US Pershing II missiles. It was a gift of the Soviet Union to the United Nations in 1990.